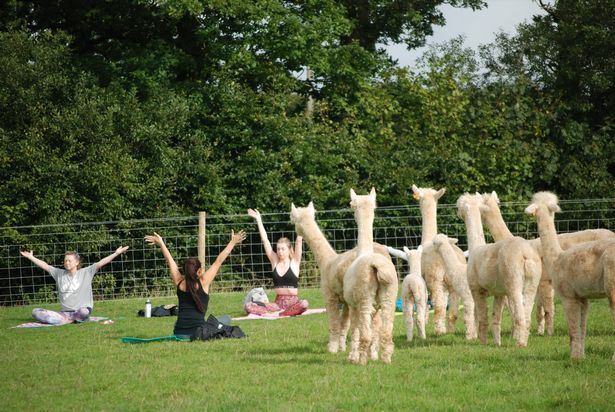 An 'off the grid' farm in the Devon countryside has become the UK's first business to offer customers 'alpaca yoga'. Rosebud Alpacas, a self-styled 'off the grid' smallholding near South Molton, in rural North Devon, has become the UK's first to offer the peculiar outdoor activity. Owners Nick and Lucy Aylett breed Huacaya alpacas and own a small flock of Pedigree Charollais sheep. They host a wide-range of alpaca activities, such as alpaca walking, alpaca picnics, art workshops involving alpacas and an all-out 'alpaca experience'. But alpaca yoga is the star of the farm's diversified offerings, where customers are taught by qualified instructor Sian Bartlett. The couple say the activity is for the 'mind, body and soul' which will leave customers feeling 'calm and stress free'. This year's date for spring class is April 13th. “We are passionate about nurturing mind, body and spirit, being within the herd is great for stress relief, so we hold classes such as yoga in the alpaca paddock, the alpacas are inquisitive but do not invade your space,” the pair say.